The most spectacular dinner you'll ever have. A note about your dinner tickets and the IRS: because the Fair Market Value of your tickets is the face value, your ticket is not tax deductible. 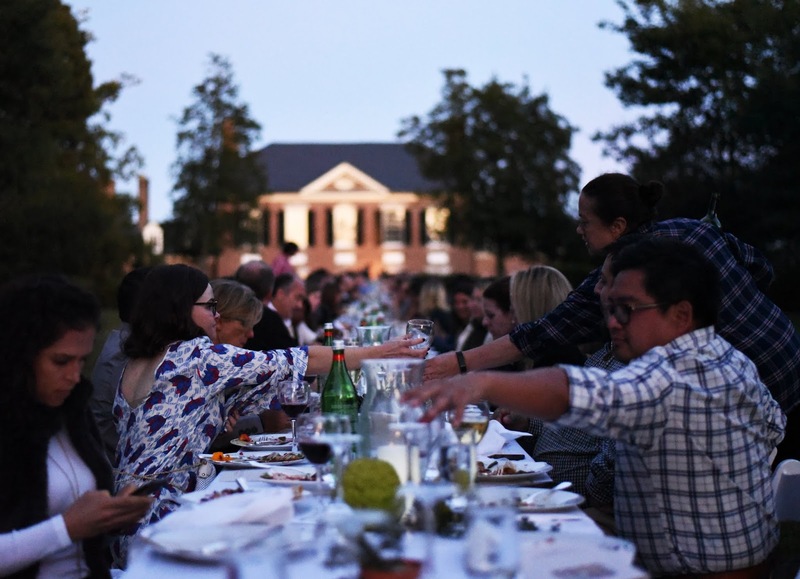 However, because our chefs are so generous, this dinner generates thousands of dollars to support of the Veteran Farmer Program.Sponsorships, however, are tax-deductible minus the face value of the tickets included in your chosen package. Please contact pam@arcadiafood.org to discuss your sponsorship and the tax benefits. My name is Nick Wood, and I have been working as one of Arcadia’s two Veteran Farm Fellows for six months now. One of the things I have so far found the most satisfying about my work at the farm is getting to see the literal fruits (and vegetables) of my labors. I put seeds into soil, and real food is the result! Since I have had a hand in growing all the food that we prepared for delivery to the Mobile Market, getting to work on the market for a week gave me a similar, but magnified, sense of satisfaction. Not only did food come about as a direct result of my work, but people bought it, ate it, expected it, relied upon it, and loved it. During my week with the Market, I mostly just pitched our food to our customers. While many of our clients knew exactly what they wanted (and told us so in no uncertain terms), some of them were new to some of the vegetables and greens we had on offer. Those curious customers were happy to talk recipes and preparation tips, and I received more than a few excellent ideas and recipes in return. The common thread of those many conversations was the passion everyone had for good fruits and vegetables. I was reminded of one of the misconceptions that Arcadia was founded to fight against- the idea that there aren’t any good grocery stores in these food deserts because they ‘don’t want healthy food.’ Many of the people I spoke to had been to the farmer’s markets in the better served sections of DC, like Dupont Circle- which meant that they were willing to take what must have been a long bus and metro ride to get to the good stuff. I got to see firsthand that “missing” desire for good, sustainable food, and I assure anyone who cares to ask- the demand is there. Bring them the food at a price that they can afford, bring to them the dignity of good choices, and the people will come. The desire for good food and the way we bond over preparing and sharing it is a universal element of the human condition. Helping someone eat well is the first step to helping to lift them up. And exchanging recipes and talking about food is a great way to get to know who someone really is. I was raised in the Upper Midwest, and most of my family is from the Deep South. And yet since coming to the District, the most at home I have felt has been sitting with a bunch of vibrant, cantankerous, enthusiastic elderly black folk in the shade of our market tent after the rush waned, talking about how best to prepare a rack of ribs. Getting to know the people Arcadia serves puts me in mind of a quote by the late, great Anthony Bourdain: “People are generally proud of their food. A willingness to eat and drink with people without fear and prejudice... they open up to you in ways that somebody visiting who is driven by a story may not get.” I can’t help but wonder if maybe as a people Americans would be a little better to each other if we broke bread with our neighbors a little more often. It's a wrap on Farm Camp 2017! As we wind down our final week of camp we are so grateful for everyone who makes this experience possible. Thank you to all the parents, guest educators, counselors, staff, fruits, vegetables and campers!!! We hope that everyone will continue to try local fruits and vegetables and connect with the farms in their area. See you next summer! We are beginning our last week of Farm Camp with a great group of campers, lots of fresh vegetables, and fantastic guest educators. We would like to extend a huge thank you to Alison from Big Bear Café in D.C. who did an incredible workshop with our camp. She taught us about making sourdough, june and kombucha and everyone got to bring some dough and june starter home! For our last week we will be introducing Heather Johnson, Arcadia's full time Education Director. Heather oversees Arcadia’s education programs which include Farm Camp, Farm Field Trips, Farm in the Classroom and Mobile Market School Programs. She develops and helps maintain Arcadia’s educational garden, known as the Groundhog Garden. Heather has a master’s degree in Education from Wheelock College in Boston, MA and over the past two decades, she has dedicated her career to providing hands-on, interactive experiences that promote deep exploration and collaboration in authentic environments. While with the Children’s Museum of Richmond, VA, Heather worked closely with communities in need and recognized how little access these communities had to fresh, affordable produce. She wants to work with Arcadia to combat this issue. As families spend less time outside and have less access to nature, she relishes the opportunity to get kids outside to discover the simple yet extraordinary wonders of the garden and the delicious rewards that await. We hope you have enjoyed getting to know our team! While preparing a bed to plant squash a camper came up with a weeding spell: "Weeds weeds weeds come up weeds just come up if you don't come up we'll pull you up"
"Are your chickens for sale?" "No" "Awwwww but I love them"
When I asked to take a photo of a camper with their plate of eggs: "You can have some they are amazing!" Beets: "it tastes sweet and fruity. I would put it in a salad"
Okra: "okra is so good!" Parsley: "It tastes really frizzy. Kind of like mint. It might be parsley"
"Bees are our friends. They give us honey and are just eating their breakfast... 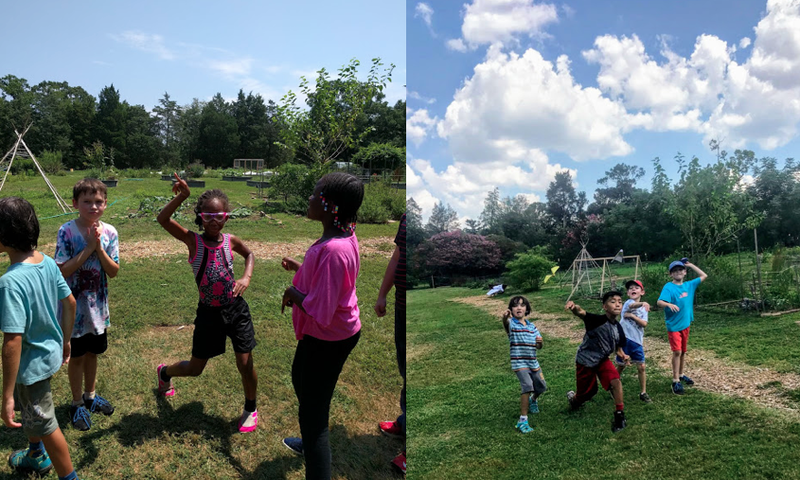 It might look like the bee is coming to sting you but they are just flying around looking for a flower to pollinate"
We had a blast at our tortilla fiesta today! 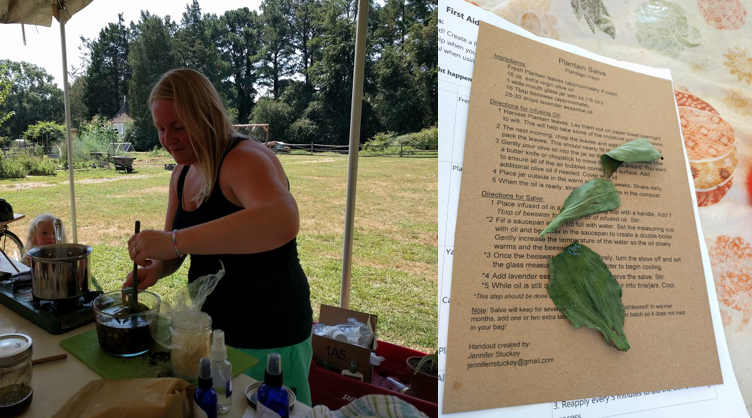 Thank you to Jennifer and Sophie for coming to teach us about natural herbal fixes to chef injuries! All of our campers went home with an incredible (and easy to make) plantain salve made by Jennifer. See you next week for our last week of Farm Camp 2017! Extra special Wednesday blog post for our extra special friend Jonathan Bardzik! We are so grateful that he shared his love for vegetables, expertise in farm to table food, and enthusiasm for creativity with our camp. Here are some of our takeaways from Jonathan's visit. 1. It should be fun! 2. It should taste GOOD! If it doesn't taste good, try something else. 5. I believe that you can enjoy "special food" (like oysters) any time, any place, no matter who you are/how old you are. All food, all knowledge, and all experience should be available to everyone. Our kids were eager to help make and help eat the fantastic dishes Jonathan prepared today. Our menu of farm-fresh fried rice, tomato dill vinaigrette, and quick cucumber ginger cilantro pickles had our campers trying new vegetables, spices, and cooking techniques. Quite well received! Small Chefs 1 is off to a delicious start. 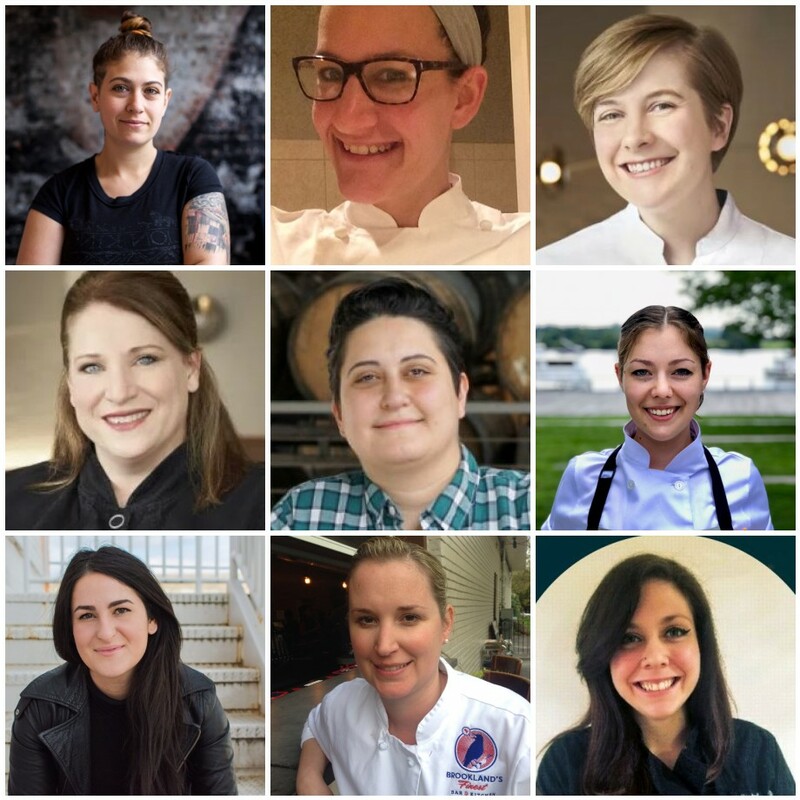 From quick pickling to scrambling veggies and eggs, these small chefs are blowing us out of the water with their kitchen skills, patience, and creativity. We can't wait for our workshop tomorrow with fantastic chef, storyteller and educator Jonathan Bardzik. xIvy Assiter is excited to be serving as Camp Manager to this year’s Arcadia Farm Camp. She recently moved to Virginia from Orlando, FL where she spent her time inhabiting many different roles in the local food scene. She is most proud of her position as SNAP Coordinator at two separate farmer’s markets where she was able to work closely with her community, and foster relationships between shoppers and farmers. 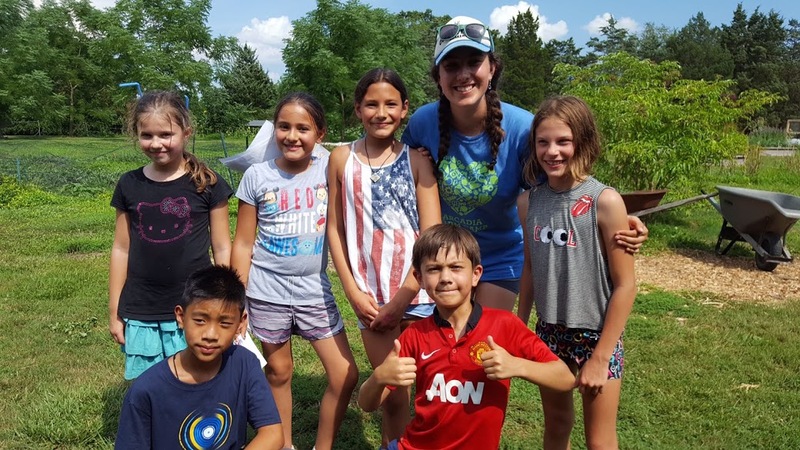 Ivy knows how summer camps in an outdoor setting can impact a child’s development; she has attended and worked, as well as managed, outdoor experience camps for a total of ten years. Her love for local food, food accessibility, and the outdoors brought her to Arcadia, and she can’t wait to see what this summer has in store! She’s really looking forward to having the okra from this upcoming growing season! Emily is interning with Arcadia this summer through the Tisch Summer Fellows Program at Tufts University. She has always loved working with kids and is a big fan of outdoor exploration, experiential education and good food. Emily has worked on multiple organic farms in France and was a substitute teacher at La Puerta de Los Niños in New Mexico. She is always looking for ways to share and cultivate her love for the outdoors and healthy eating and is so excited to work with a program like Arcadia! If turned into a vegetable she would probably be a roasted pumpkin, sweet potato, or brussel sprout. Hello and happy Thursday! We have explored many aspects of seasonal eating and cooking this week. From blind taste tests to squeezing cabbages to make sauerkraut, these seasonal eaters have been actively learning about sustainable food from farm to chef to table. A big thank you to our horticulture friends at Mount Vernon who brought a beautiful 4 month old Hog Island lamb, to Dylan for a fantastic fermentation workshop, and to Rosemary for her expertise on vermiculture and composting. "What did you try for the first time today?" "Salad, onion, tomato, hummus, dressing, cucumber"
"I make salads and they're the best because I make them"
"After our buzzing bees water game we saw a bee with knee buckets pollinating in the garden!" "I've never tried pesto before"
"pesto is soo good!" "you're going to love it" "pasta with pesto is perfection" "one time I snuck with my sister and ate a whole bowl of pesto"
An older camper: "That's the first time I've had beets in my life. No joke. Those are actually good! I'm going to have beets tomorrow or tonight"
A younger camper: "I know this one!! Okra! We eat it at home in an Ethiopian dish with fish and chicken"
"The salsa is out of this world!" "Salsa, like guacamole without the avocado." "What are you excited to make today?" "I've tasted butter and I want to try new things, so I'm excited to make salsa and pesto and sauerkraut." "I can't wait until we pet the sheep. That is the best part." Hello and welcome to all of our Seasonal Eaters!! We've got a creative bunch this week. The composting cornsnakes, farm wolves "aooooooooou", coolcumbers, zombie zucchinis, and happy harvesters have jumped right into a week of edible exploration. 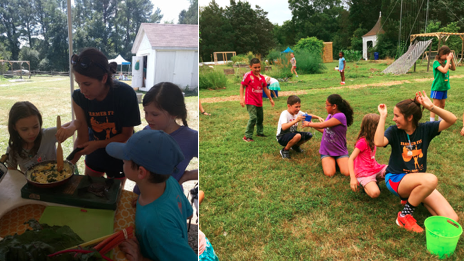 These campers have been harvesting, making seasonal menus (with dinner items such as a chinese stir-fried eggplant with sautéed okra served with a tangy beet and radish salad topped with a wood sorrel garnish), learning knife skills, and making pollinator smoothies on our bike powered blender. This Tuesday we'll be highlighting Emma and Robel. Emma Tober is one of our camp counselors at Arcadia Farm Camp this summer. Emma was introduced to the world of sustainable agriculture and the magic of growing your own food while studying Health Science at Virginia Commonwealth University in Richmond, VA. During her time at VCU she was an intern for the Office of Sustainability where she was involved in numerous environmental projects on campus and volunteered with VCU’s community gardens and food pantry. Emma has developed a passion for community health and empowering youth to live and lead healthy lives regardless of their background. After graduating last May, Emma spent a year serving in a 2nd grade classroom as a tutor and mentor with AmeriCorps in Washington D.C. Emma has always enjoyed working with and inspiring youth and is excited to inspire and learn from others while growing, cooking and eating fresh, delicious food at farm camp this summer! Robel just graduated from George Mason University with a degree in Public Health and Nutrition. He studied Permaculture Design which gave him the skills to apply principles of sustainability, biodiversity, and environmental health to farming and gardening. He is passionate about health and fitness. He loves to stay active and make nourishing meals. His favorite hobbies are training jiu jitsu, rock climbing, biking, running, and enjoying the great outdoors. He has experience working for Whole Foods Market and several local organic farms. This week we explored farm creatures big and small. Hissing cockroaches and a Nubian goat were two favorites. A big thank you to the guest educators who came to Arcadia's Hilltop Farm this week to share their expertise on goats and bugs. 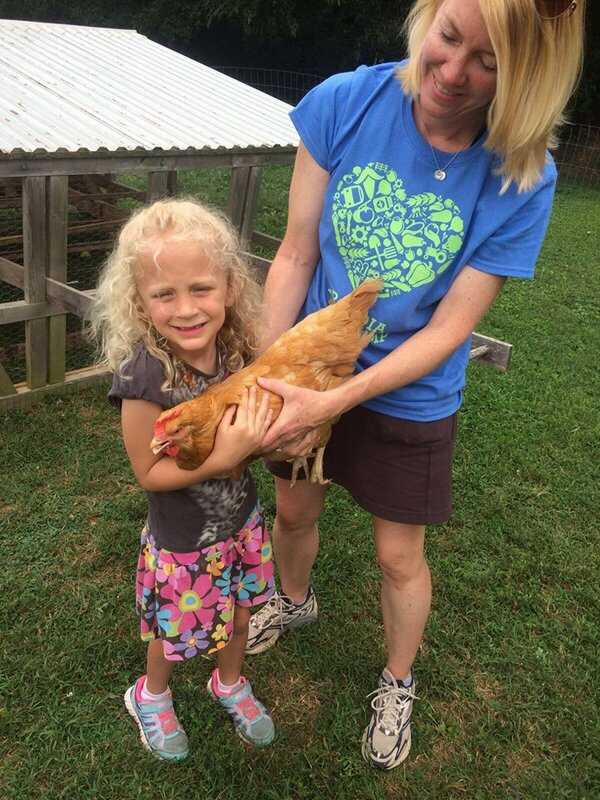 We've had a wonderful week exploring the world of farm creatures with some fantastic campers. Thanks again to all the people who make this camp possible! Hello and welcome to week two of Arcadia's Farm Camp - Farm Creatures! Our week has started swimmingly with a box turtle spotting under the grape arbor, many bug races, and time spent caring for our hens. We're going to continue our Tuesday tradition by introducing two of our fantastic Farm Camp counselors: Talia and Dani. 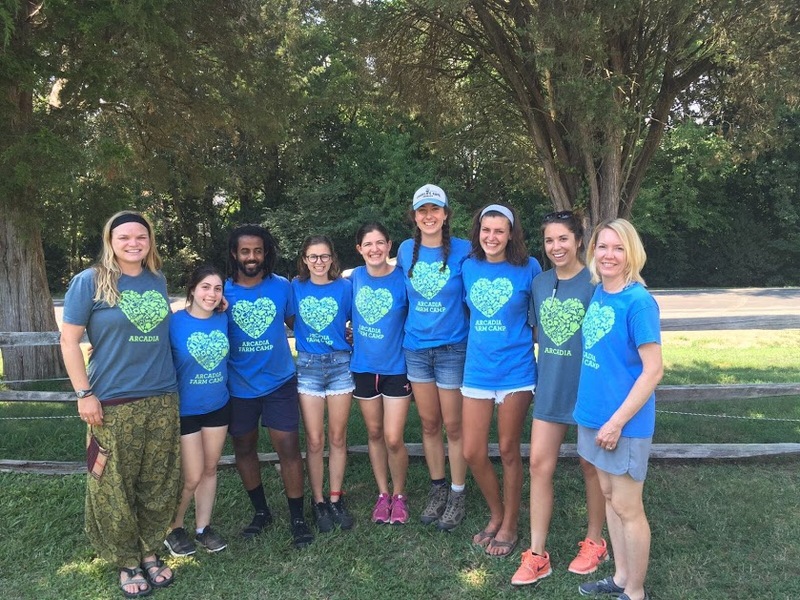 Talia Schmitt is an Environmental Community Health major at the College of William & Mary. In 2013, she co-founded an environmental education program, Eco-Schools Leadership Initiative (ESLI) where high school and college students educate elementary school students about the environment (www.eslileaders.org). 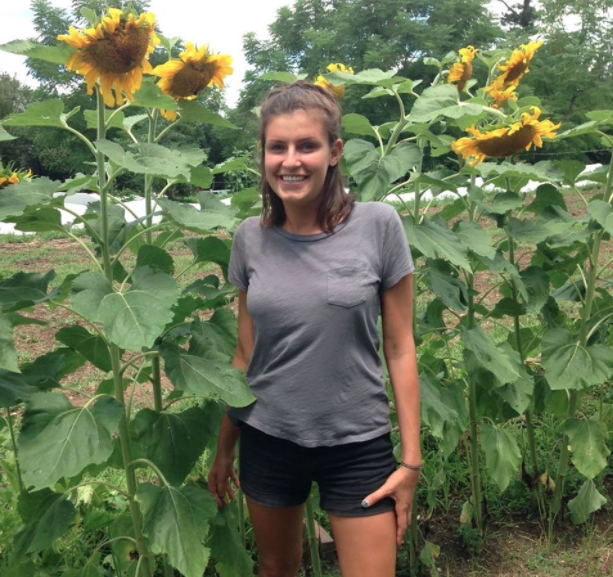 On campus, Talia works as a Dining Sustainability Intern and is involved in a project bringing produce from a local farm back to the college’s cafeteria. 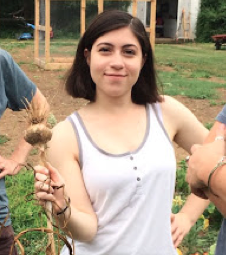 Some of Talia’s favorite farm & food memories include eating asparagus right from the ground, and viewing the bright blue artichoke flower for the first time! She can’t wait to embark on the exploratory and tasty adventure of farm camp with some eager campers! Dani is a Farm Camp Counselor at Arcadia Farm. 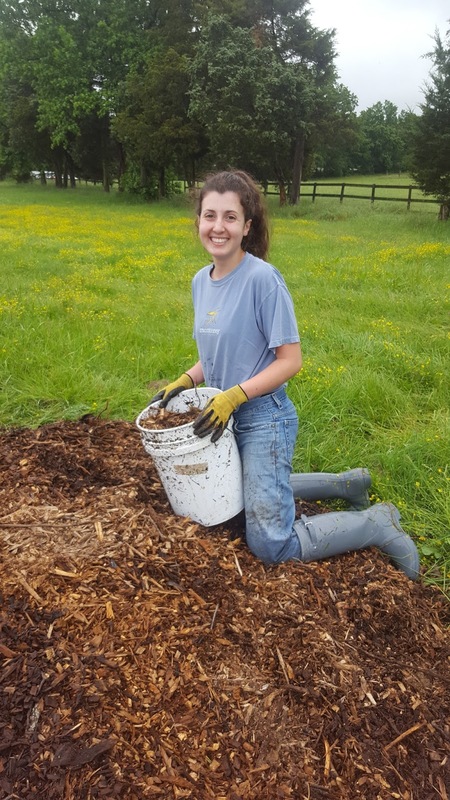 She recently graduated from Grand Valley State University in Michigan, where she developed a passion for both community outreach and sustainable agriculture. She took many courses focused on sustainable agriculture, and worked with many community farms and gardens. 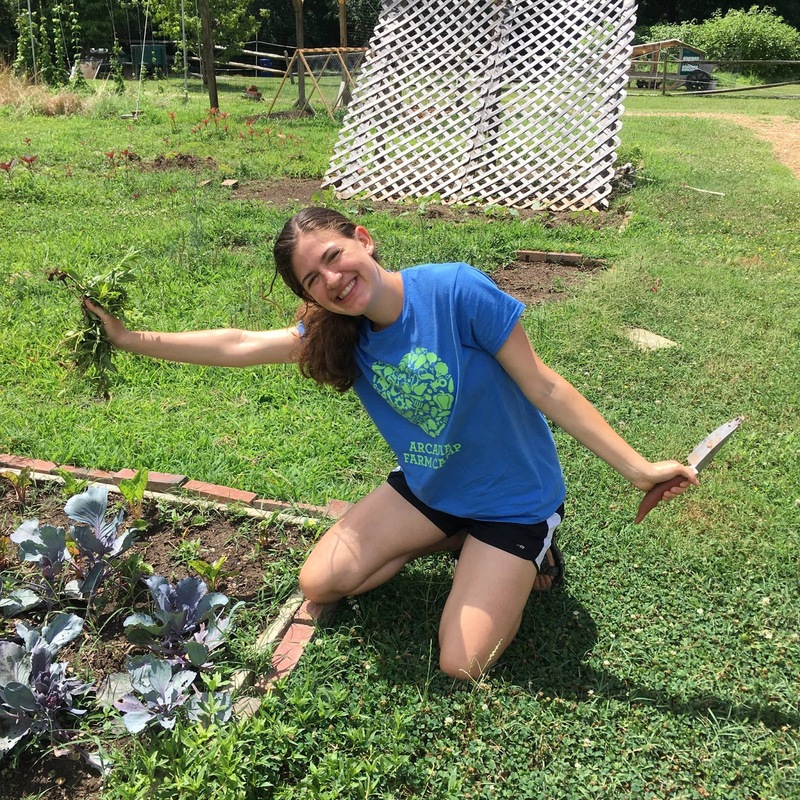 In addition to sustainable agriculture, Dani loves exploring, cooking and being outdoors – and she is so excited about sharing her passions with the campers! When describing what Lamb's Ears SHOULD be called: "Puppy Belly"
While touching the potting clay in our "seed balls" activity: "this feels like touching clouds"
Looking through the compost pile: "I spy an invertebrate!" Camp Director pun: "What did the mom cow say to the baby cow? You gotta go to bed it's PASTURE bed time"
On a bug catching excursion: "Guard my Harlequin Beatles!!" After our beekeeping lesson: "I have a business plan for the bees...have them sting the cockroaches"
We have heard shrieks of laughter during our water games; inquisitive questions when Farmer Katherine came to discuss crop rotation, seasonal harvesting, and proper washing techniques; hushed excitement when Farmer LaRon gave a lesson on beekeeping (including a demonstration with the bee smoker); and "ooo this is good"s when they try our farm fresh cooking creations for the first time. And don't forget the wide eyes we see when they hold a warm egg or feel the soft feathers of our hens. A huge thanks to everyone who made this amazing first week possible! Welcome Back to Farm Camp! This summer we're kicking off Farm Camp with some of our newest Young Farmers!! 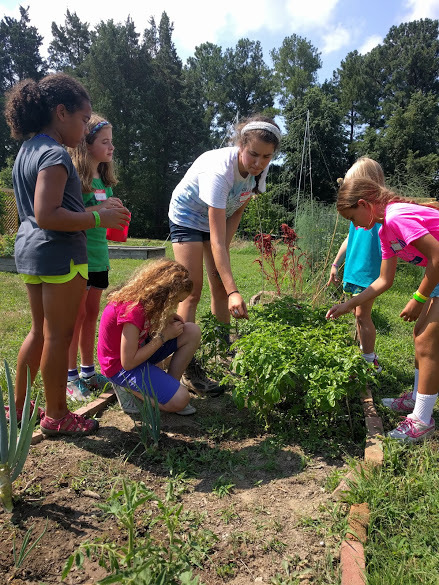 Throughout the next five weeks we will be highlighting our incredible camp counselors - with backgrounds from soil specialization to education - and the wonderful campers who are harvesting, cooking, and creating in our Groundhog Garden. 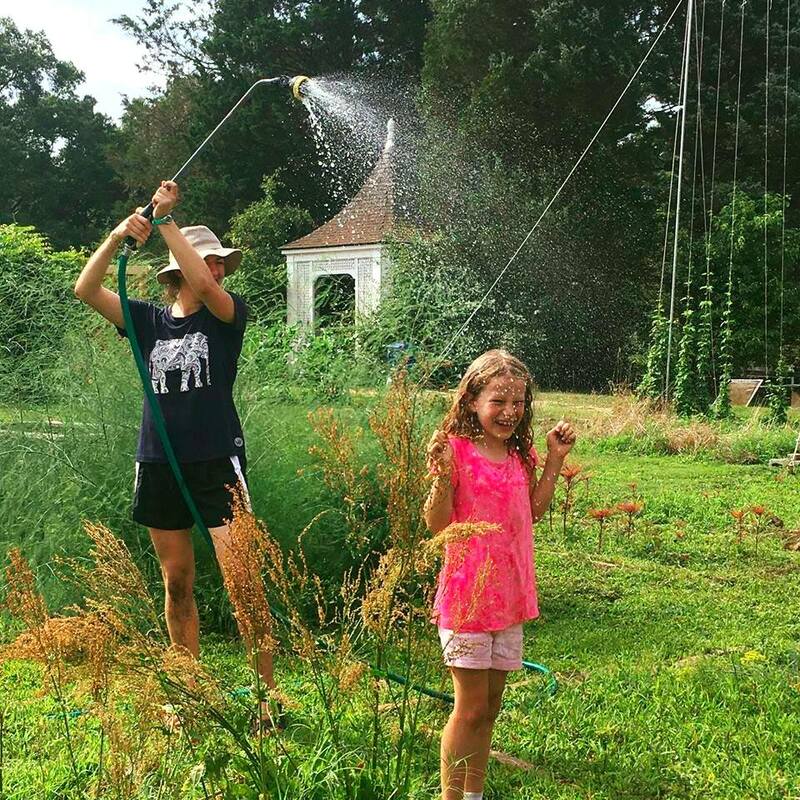 To get us rolling we would love to introduce Sarah, whose campers this week have an affinity for weeding: who knew?! Sarah has been working in environmental education and conservation for 5 years now. From nature centers in Fredericksburg, VA and Montpelier, VT to the mountains of Taos, New Mexico and the forests of Paraguay, many experiences have led her to Farm Camp with Arcadia. 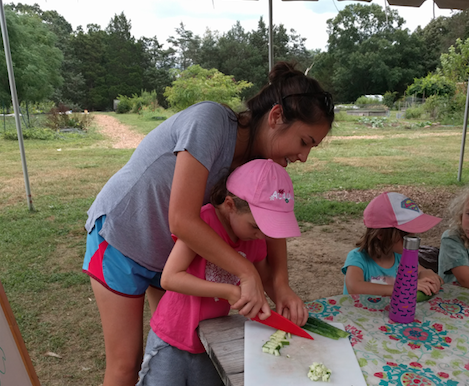 She loves working with kids and the creative energy they provide and hopes to learn new ways to spark their interest in locally sourced, healthy eating while at Arcadia. Her favorite vegetable is zucchini because ZOODLES! By Jenna Barufka My entire experience at Arcadia will be encapsulated in a sum total of seven days. This seems impossible to me, considering that I feel overwhelmed with new information. I went into my internship with Arcadia completely blind. I had barely even gardened before. In retrospect, I have no idea what I thought farming was going to be like. I suppose I thought it would be simpler. I thought there would be fewer pieces to consider. Having spent the past twelve years of my life in school, I expected a similarly regimented process of learning and getting things done; be told the facts and apply them, be told rules and follow them. But farming is filled with an uncertainty I’ve never really had to deal with before. We have things we know to be true, of course, about the plants and the insects that eat them and the weeds that grow by them. But we also have a million things that we can only guess at, like how much it will rain and when, and whether or not we’ll be able to stop mice from eating our seeds. Farming is predicting, observing, compensating, waiting, hoping. The more I learn about farming, however, the more it becomes incredibly clear to me that I know nothing about farming. Each time we embark on a new task, Katherine explains to me and the other volunteers what we are doing and why. I feel as though there must be always one millions things flying through her head. The other day, as she explained how to transplant squash seedlings into landscape fabric, she told us that “they don’t like the fabric worrying against their stems.” Perhaps this is common sense to some people, but it is something I would have never, never thought about. In fact, to even consider that there is a certain way the stems of golden glory squash like to be treated is so far from my average train of thought that it, despite seeming so simple, feels revolutionary. I’m not getting my questions answered, I’m being informed that there were questions to have in the first place. It’s not, Oh, I’ve always wondering what the stems of plants felt about rubbing against landscape fabric, it’s, The stems of plants care if they touch landscape fabric? And what’s landscape fabric? I feel as though all my life I have just assumed that certain things are as simple as they seem; seeds fall, plants grow, etc. Now I am unlearning. In fact, a large part of my experience at Arcadia has been unlearning. There are some things you have to unlearn if you want to be of any use at all. Unlearn a fear of bugs. Unlearn hesitancy to get dirty. Unlearn infrequent water drinking. In the best way possible, seven days at Arcadia has been a process of forgetting; forgetting the simple way I thought about farming, forgetting the limited way I thought about learning, forgetting the structured way I thought about working and getting things done. It’s been a satisfying personal experience, not only because it allowed me to meet a lot of interesting people and doing rewarding work, but also because it gave me a foundational understanding of something I had no concept of before. It’s only a beginning, but I at least now have somewhere to begin. And, if nothing else, I have gained an incredible, incredible amount of respect for good food and good people who work in the heat. The military has an adage: Train as you fight, so you are physically and mentally prepared for whatever comes. At Arcadia, we want to follow the same principle: Train as you farm. Arcadia Farm is scrappy and productive, but needs more equipment and better infrastructure so our veteran farmers get the best, most realistic training possible. Help our veterans train as they will farm, in their next act as veteran-farmers growing healthy food for a healthy nation. Donate to Arcadia on April 5th to help us reach our goal of $30,000 to build the farming infrastructure needed to train and incubate veterans as they begin new careers as farmers. Visit https://spring2action.razoo.com/story/Arcadia-Food to make your tax-deductible to donation today. Our 2017 Spring2Action Goal is to raise $30,000 to drill and well and make other farming infrastructure improvements, like fences, equipment, and utilities, to Arcadia Farm. There is a slow-moving crisis in agriculture. The United States needs 700,000 new farmers to take up the plough over the next 20 years to replace the farmers aging out of the profession. In the last two years, America has produced just about 1,200 new farmers. At the same time, the U.S. military created more than 200,000 new military veterans every year. And if there is one thing that’s true, it’s this: they are about the only Americans tough enough to be farmers. Because let’s face it – a tough day farming can’t be too much worse than a hard day at boot camp. 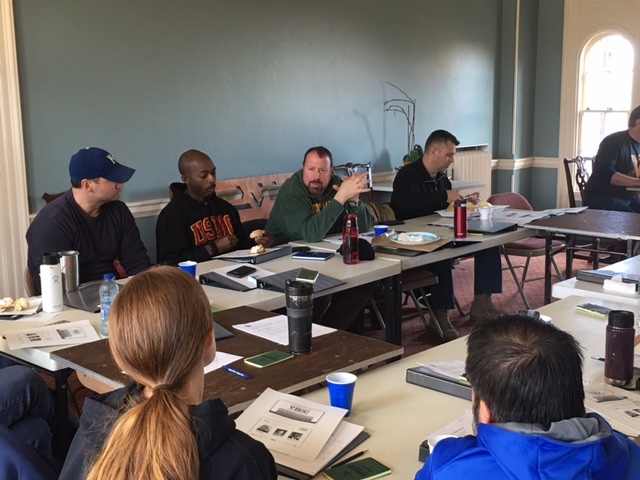 So last year, on land that George Washington once cultivated, we trained 12 military veterans in the art, science and business of farming. They learned a lot, but they taught us more – about discipline and grit, teamwork and esprit de corps. We emerged smarter, tougher, and better. And now we have the pleasure of introducing you to 2017 training class of veterans. They are 19-strong, from all four services, half men and half women, with 23 combat deployments between them – 17 in Iraq and Afghanistan. There are helicopter pilots and explosives experts; logisticians and computer experts; mechanics, infantry and intelligence experts. Active duty, Reserve, and retired, and one just returned from Afghanistan this month – they are all seeking a new life cultivating the land they joined the military to protect and served. (One Navy civilian has joined us for the training too for a total of 20 trainees). But first we want to thank the generous sponsors who making this training program possible: The Grace Communications Foundation, Boeing, Prince Charitable Trusts, Northrop Grumman, ClearedJobs.net, Neighborhood Restaurant Group, and BAE Systems. It is now my pleasure to introduce you to the 2017 Arcadia Veteran Reserve. We will have the honor of working with them every month during their 12 training weekends in 2017. Amanda, US Army: “The last several years I have kept a vegetable garden and started beekeeping this past year. I love having my hands in the soil and seeing the progress of something that started as a seed growing into something I can eat. I really enjoy beekeeping and learning about the bees and from the bees. I have always liked being outside and learning about nature. The last several years I have spent in an office environment and have realized that this type of work is not for me. I like feeling like I am contributing to something larger than myself and keeping honey bees and growing vegetables provides more satisfaction than generating endless reports that someone may or may not read. Support Arcadia's Veteran Farmer Program and Spring2Action on April 5th! And now we have the pleasure of introducing you to 2017 training class of veterans. They are 19-strong, from all four services, half men and half women, with 23 combat deployments between them -- 17 in Iraq and Afghanistan. There are helicopter pilots and explosives experts; logisticians and computer experts; mechanics, infantry and intelligence experts. 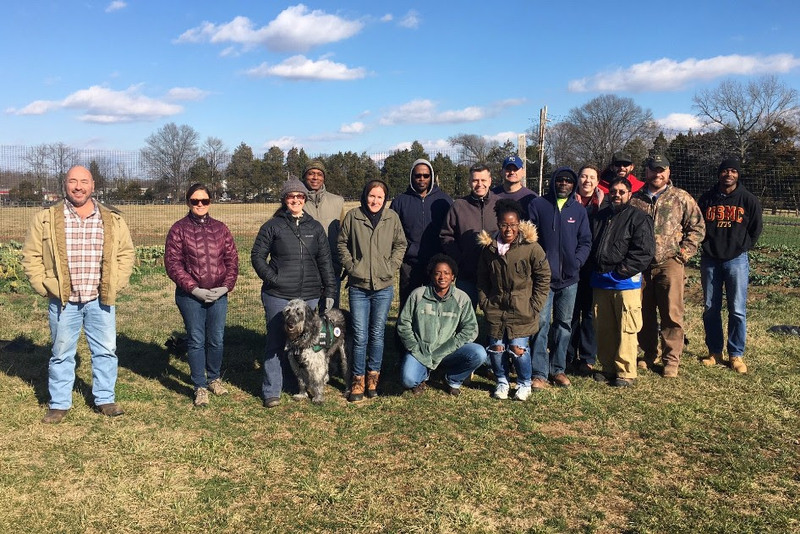 Active duty, Reserve, and retired, and one just returned from Afghanistan this month -- they are all seeking a new life cultivating the land they joined the military to protect and served. (One Navy civilian has joined us for the training too for a total of 20 trainees). But first we want to thank the generous sponsors who making this training program possible: The Grace Communications Foundation, Boeing, Prince Charitable Trusts, Northrop Grumman, ClearedJobs.net, Neighborhood Restaurant Group, and new to the group of funders, BAE. The children, veterans, and vulnerable seniors that Arcadia serves are going to need your support more than ever in the coming year. Feel the impact of your donation! Please indicate which program you would like your donation to support and see examples of what make happen below. Or ask us to apply it where the funding is needed the most. 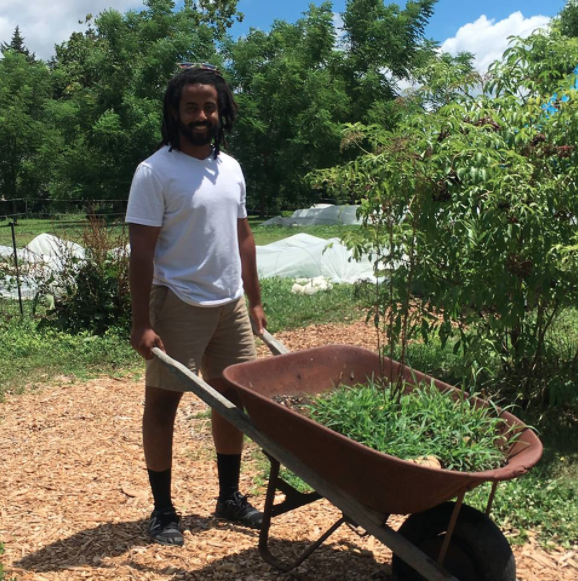 Sustainable Agriculture: Funding Goal: $25,000Support our sustainable vegetable farm! 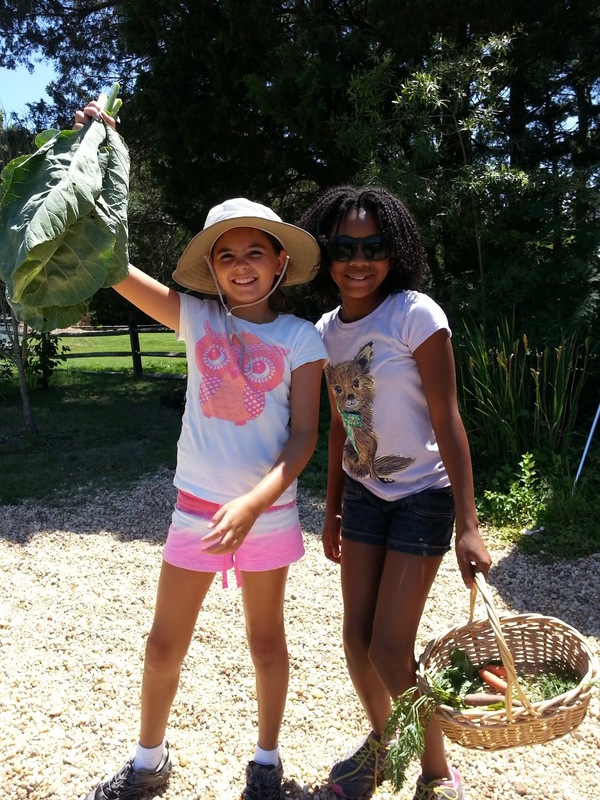 The food we grow is used in our field trip programs to make veggie lovers out of the pickiest eaters, and sold by our Mobile Market at discounted prices to families who otherwise lack access to affordable, fresh, local food. Here’s what your gift invests in: $25 – gardening gloves and hand tools for volunteers $75 – a high-quality hoe for hand cultivation, the best for building healthy soil $100 – 20 crates for harvesting $1000 supports our greenhouse rain catchment system$5000 – buys 1000 feet of deer fencing to protect our crops! $10000 – Helps us dig a well on George Washington’s old Dogue Run farm. And saves Farmer Katherine from having to walk through the scary woods and all that poison ivy to irrigate via our pump! Veteran Farmer Program: Funding Goal $100,000$100 buys lunch for 20 veterans working up an appetite learning farm skills$165 buys a complete set of textbooks for a veteran farmer on scholarship$250 buys a training hive of honeybees$1000 buys trellising for 200 feet of hops plants for the new training hop yard$1995 pays the tuition for one Veteran Reserve Member’s year-long training program $22,000 pays the salary of a Veteran Farm Fellow’s year-long apprenticeship on Arcadia Farm! 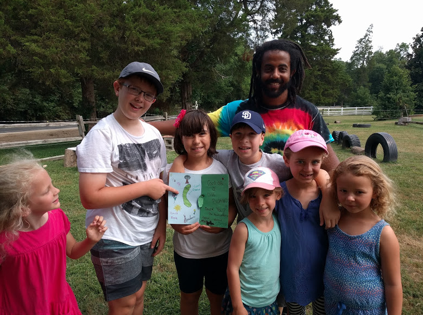 Farm Camp Funding Goal: $12,000Arcadia’s acclaimed Farm Camp reserves one-quarter of its slots for children from low-income families who otherwise couldn’t afford to come to camp. You can help make camp a reality for these kids! $25 funds a camp shirt for a scholarship camper $100 donation to the scholarship fund$300 fully funds a farm camp scholarship $1000 funds three farm camp scholarships with t shirts and reusable water bottles for the kiddos! FOOD ACCESSArcadia Mobile Markets: Funding goal $60,000$10 matches the purchase of wholesome food by SNAP, WIC and Senior FMNP customers dollar for dollar up to $10 $100 matches the purchase of wholesome food by SNAP, WIC and Senior FMNP customers dollar for dollar up to $100$1000 pays for 5000 outreach fliers and coupons$6,000 matches all WIC mothers’ purchases of healthy fruits and veggies for their children from the Arcadia Mobile Market next season $7,000 matches the purchases of fruits and veggies by low-income senior citizens. $40,000 supports our distribution network and reefer truck so we can move food from local farms to the city.